Well it’s undisputed. The bake sale last Saturday was a huge success! A nice sum was raised for Share our Strength, a national program that combats childhood hunger and I was glad to help in some small way with my Nutter Fluffer Brownies Sandwiches. Nutter Fluffer sandwiches, for those not in the know, is peanut butter and marshmallow cream spread on white bread. Fact: I had another dessert in mind and it failed miserably. Brownie on a stick just did not… well, stick. The brownie base was too fudgy and I discovered it required too much time to assemble each one. And I had to do this for a few dozen. I was starting to freak out. 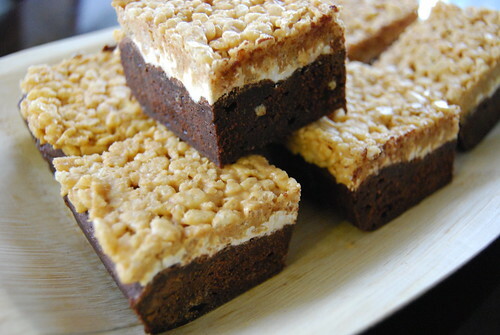 The following day, I adjusted the same brownie recipe but added a layer of marshmallow cream fluff and topped it with peanut butter rice krispies. If you’re the type of person who likes accuracy in your desserts, you’ll get that in the brownie base which is pretty amazing on its own— it’s fudgy and rich— exactly how I like my brownies. For the rest of this treat, I winged it: I mixed krispy rice cereal with peanut butter with melted chocolate chips. Here’s my attempt at recreating it. 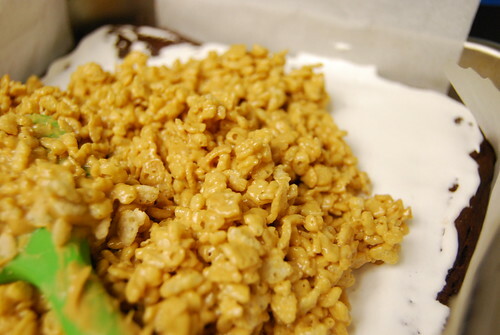 Rice krispy treats are so hard to mess up. The layer of marshmallow fluff and peanut butter chocolate rice krispy treats transform the dessert into something else. It’s fudgy and crunchy, sweet and a slight bit salty— all in one bite. The brownie base can easily be doubled for an extra thick layer (as seen in the photos). But if you prefer more of a rice krispy layer, that can be increased as well. Many thank-yous for everyone that purchased my treats!! Line the bottom and sides of an 8-inch square baking pan with parchment paper, leaving an overhand on two opposite sides. Combine the butter, sugar, cocoa, and salt in a medium heatproof bowl and set the bowl in a wide skillet of barely simmering water. Stir from time to time until the butter is melted. Stir in the vanilla. Add the eggs one at a time, stirring vigorously after each one. When the batter looks thick, shiny, and well-blended, add the flour and mix until combined. Bake until a toothpick plunged into the center emerges slightly moist with batter, 20 to 25 minutes. Remove from oven and let cool on rack for 10 minutes. Spread marshmallow cream evenly on baked brownie. In a medium microwaveable bowl, add peanut butter and chocolate chips and microwave for 1-2 minutes until chocolate chips are barely melting and can be easily mixed with peanut butter. Add cereal until combined. Add more cereal of necessary. Spread cereal mixture on top of brownie and marshmallow. Using a piece of waxed paper the size of the pan, evenly press down evenly. Refrigerate for 30 minutes or until set. I purchased one at the bake sale, and it was AMAZING! Thanks for posting the recipe! Thanks for buying one and I hope you enjoy the recipe! You are a brilliant woman. I suddenly want a rice crispy treat now. Hmm. The genius of rice krispy treats are they been be had for breakfast OR dessert. They do have cereal after all. I think I drooled a little on my report. Making that at home would be hazardous for my health since I’d eat the whole pan. Probably before it even cooled. Yeah, drooling at work is a big no-no unless you work at a children’s nursery. These freeze amazingly well but I guess you still have to deal with the temptation. hi darlene – great dessert! loved the different layers and textures! we finally finished ours off today! i also liked how you incorporated the word “fluffer”. HA! Yes, this brownies will definitely fluff your appetite. They are addicting! And sinful too. These look insanely amazingly delicious! They were. Sweet with a bit of salt — what’s not to love? ?